This expedition takes place in one of the most beautiful places on Earth - Svalbard. Its largest island, Spitsbergen, has an expansive feast of mountains, glaciers and icecaps and at almost 80º north, it is a frigidly cold place in March, making it the perfect stage for both a polar expedition and cold-climate training. 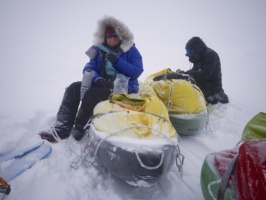 We guarantee that this 10-day program will whet your Arctic appetite, at least temporarily, and set you up for survival and savvy in almost any polar or extreme-cold environment. We will arrange to meet at your hotel and complete a gear check in your room (hotel accommodation is not included in the price). Begin preparations. Welcome dinner. Preparation, packing, equipment check (you will require hotel accommodation). Our route will be dependent on snow and ice conditions but we will be traveling in expedition style - skiing and towing sleds and moving in a continuous style covering 10-20km per day depending on terrain and conditions. Return to Adventdalen, transport to Longyearbyen. You will require hotel accommodation unless you fly out immediately. Do not book a flight out earlier than 5pm if you want to depart the same day. You require 2 nights accommodation at the beginning of the trip and another at the end if you decide to stay the night. Our Svalbard Expedition covers a wide range of topics and terrains, preparing you for a full-on expedition to almost any polar environment. We meet in Svalbard’s capital Longyearbyen, on the island of Spitsbergen (Norway). After two nights and a full day of preparing equipment and packing sleds and a couple of technical seminars on equipment and navigation, we travel by boat to the start of our expedition in Tempelfjorden (Tempel fjord). Depending on how much of the fiord is frozen we may start at the edge of the sea ice or make it all the way to the base of Von Postbreen (Von Post Glacier). In either case we ski onto the coast and camp well before we lose the light. Flanked by spectacular mountains we ski the length of Tempelfjorden to the base of the Von Post valley before crossing the frozen lakes to gain access to the glacier. Von Post is a short but steep glacier and we take the entire day to ascend it, camping high with views behind us over the majestic fiord. The next day we continue upward and over a pass to the top of Rabotbreen, a long river of ice that curves west and meets up with Sassendalen (Sassen valley) where we camp. A gentle ski down Sassen's long flat valley floor takes us to a wonderful waterfall hidden in a frozen amphitheatre, a highlight of the trip. We camp nearby. The next day we ski up Eskedalen, a connecting valley inhabited by grazing reindeer, to Drønbreen and the start of an exciting mountain traverse. Alpine passes, jagged peaks, and glaciers greet us as we meander this high route, with spectacular views down to distant valleys and fiords. We'll camp a night or two up here. Awaiting us is an eye-watering descent of Møysalbreen. Using our sleds as toboggans, we straddle our skis either side and blast down the glacier, going as fast as you dare or as slow as you like, steering by edging and leaning. The hauling traces double up as brakes so we are never out of control. At the glacier's termination we visit a beautiful wall of blue scalloped ice before descending steeply down a narrow gulley to the start of Janssondalen, an outlet valley that spills into Adventdalen and our last camp. The next day we ski across the valley to our waiting bus and return to Longyearbyen. Temperatures can drop to -35c so do not underestimate the severity of this trip. 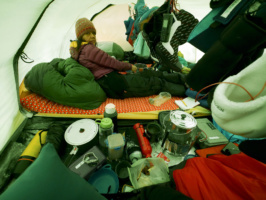 After the sun sets the cold descends on the camp and only stoves, polar sleeping gear and high-energy food can keep you warm. With proper polar clothing and equipment and the best guides in the world you will learn not only how to survive but how to thrive. NOTE: Due to seasonal variations we may alter the route to maximise your experience. 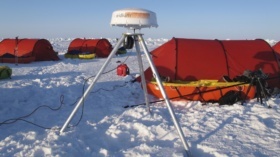 For the Svalbard Expedition program your sled will be 45 to 50 kg, 100 to 110 lb. Some of our Expedition customers have never been on skis before. It is useful to have prior experience but not mandatory as we will train you at a manageable pace while you are on the ice. How long do we ski every day on the Svalbard Expedition trip? We start relatively gently, skiing for around six hours on the first day. We cover this by skiing one hour, then have a short stand-up break, then another hour with a sit down break. We do the same again and have lunch and then another 2 hourly sessions before camping. When everybody feels ready we extend to seven and perhaps eight hours per day.